Classes have begun at our brand new location and we'd love to see you there! Classes have just resumed over at Reflections School of Dance! This year, we began classes in a brand new studio. To celebrate the opening of the new studio we would like to invite you to the Grand Opening! Come and join us, Saturday, September 20th. Stop by the studio anytime between 2:00 & 4:00 pm. 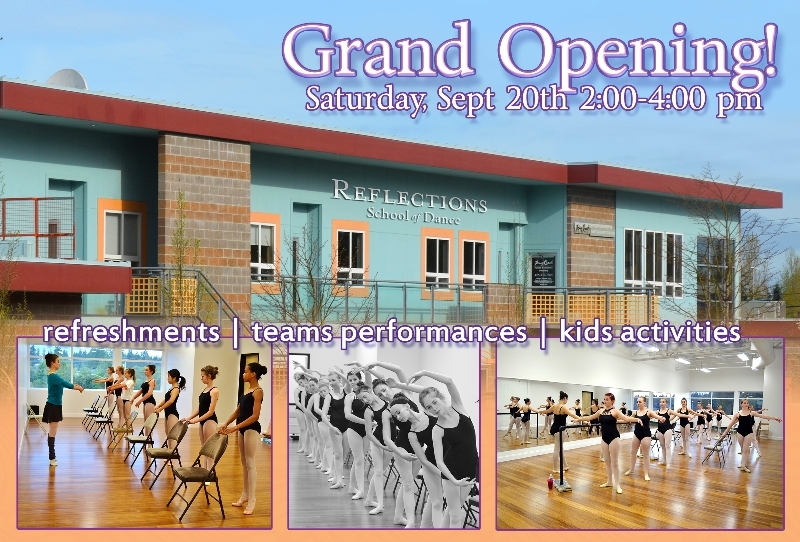 Visit with staff, see the new facility, enjoy refreshments, join in some dance activities for kids, and experience live entertainment by the Reflections Dance Teams every half hour! It's not too late to register for dance class! September is free trial class, bring a friend, & open enrollment month! Click here to view our current schedule and see which classes are full, open, or have a wait list to run. To go along with our new location, we have added new classes to the schedule this year! 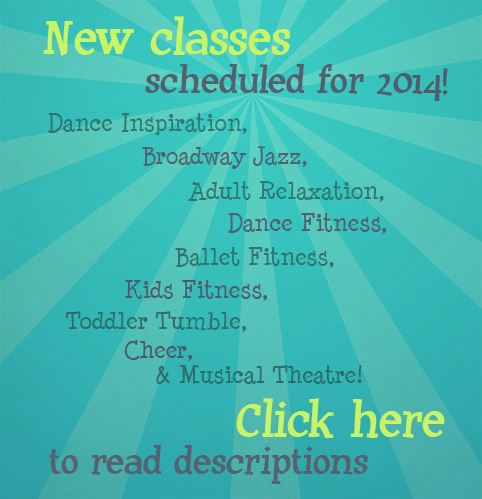 Check out information on our new classes such as Adult Barre Fitness, Cheer & Musical Theater. Please contact us if you would like to take a free trial class and see if you like any of our new classes. Click here to view some photos taken inside our new location. Also, click here to view the album of the process of our recent move. Click here to view our beautiful new online photo gallery, and click here to view our new video gallery. Come and try a nontraditional partnering workshop hosted by our friend Bill Wade and dancers from his acclaimed and awarded Inlet Dance Theater, Cleveland, OH. Join us for our first master class in our new location on Saturday, September 27th at 5:00pm. Click here for details. Keep in touch with us for a roll out of Master Classes all year long. Join us for our regular Contemporary Choreography class on Friday nights at 7:30. This class is open to all students of intermediate and advanced levels, and is our only regular drop in class on the schedule. We hope to see you there! If you would like to keep in contact and add Miss Debbie as a friend, please check out her Facebook page! Read her book "Life in the Studio" here, if you haven't already. Click here to see our report and photo album of our recent Dance Mission Trip to Uganda, Africa this past summer. It was amazing! Click here to check out our current staff and see the bios of our newest teachers! Contact us if you you or someone you know would be interested to see our current Job Posting for a new opening of Administrative Assistant. See our YouTube Dance Recital 2014 Video Montage here - or any of our other over 500 videos with over 1000 subscribers and over 430,000 views! Enjoy our Inspirational Dance Photo Album here. If our website and Facebook page doesn't answer any questions you may have, please feel free to email or call us anytime. Be sure to check our online calendar to see all important dates for the 2014-15 year. Thank you for reading. We hope to see you at our Grand Opening! Copyright © 2014 Reflections School of Dance, All rights reserved.